Gee, J. P. (2005). 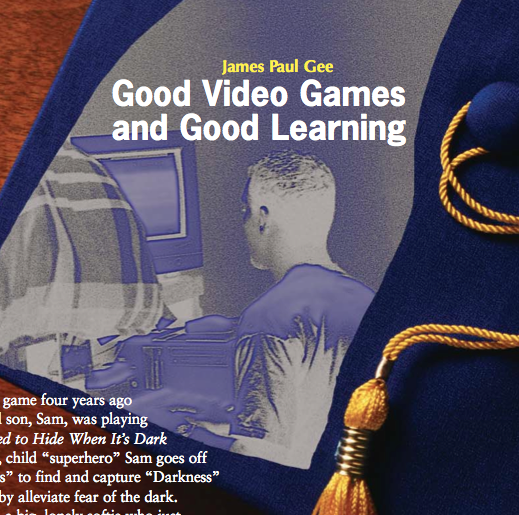 Good video games and good Learning. Phi Kappa Phi Forum, 85(2),33-37. Paul Gee never mentions GBL, but that is what it is about. The bulk of the paper (non-peer review) is a list of 16 “learning principles”, each of which explicates the powers of a digital game as a teaching tool. For example, Gee lauds games because they afford agency, they are pleasantly frustrating, and they allow for distributed cognition. He says we can be creatively productive in a game, we can safely make mistakes, and we can learn from our mistakes. I ask, what are these “principles”, and are they exclusive to games? I agree that we learn when we play games, but what do we learn? Is it skill and practice? What content are we learning when we play football? Scrabble? Basketball? Chess? What skills or processes are we learning? Why are the learners playing in the first place? Is it controlled motivation (they have to play) or is it autonomous motivation (they choose to play)? Does turning the object of our interest into a game cheapen it? Demotivate learners? Game-based learning has its place when teaching something we have to memorize, teaching something boring, something that loses our attention easily. When the content is boring, use a game. A game can increase engagement, because it adds a component of external motivation. The carrot is winning the game. The flaw in GBL ideology, however, is the superhero-saves-the-day philosophy. Supporters like Gee don’t consider that learning objectives are complicated. What do you want your learners to actually learn? Content or skill or both? And, on the other side of the coin, what do your learners actually want to learn? Are you trying to sneak in multiplication tables like you sneak broccoli into your kid’s spaghetti sauce? Understand that games can be great for learning content (say, naming all of the presidents) if the only way to learn that content is to have a process to do it. That is, you would need to derive a memorization process in order to “learn” the names of all of the presidents, and this process could be the game. Getting good at the game (good at the skill) means the tool increased the efficiency of the learning, but not necessarily the amount learned (acquisition of knowledge), or the amount remembered (retention of knowledge). And what about non-digital games? Even a heady game like Scrabble teaches us more about skills and process and less about content. We learn how to win at that game itself, not about the vocabulary, or the definitions of words. It’s about skill: Strategic use of blanks, of the letter ‘S’, or a memorized list of two-letter words. Chess teaches skills too: Problem-solving and strategy— good qualities, but skills none the less. Even sport games originally were about practicing how to run from danger while holding a baby, or how to hunt collaboratively. These are all skills. And then there is the problem of interest. If I love music, love the guitar, and want to learn how to play, would a game that teaches the skill of guitar playing cheapen the reward of learning? Would you give me a sticker every time I played a G chord?